their app, PhotoSinc, Saturday night at the Emory Hackathon. It’s 11 p.m. in the Math and Science building’s biggest lecture hall. But instead of the silent, deserted place it is most Saturday nights, the room is alive with a quiet energy. Students working in hushed tones are scattered all about the giant space. In the middle of the room, three young men type furiously on their keyboards, surrounded by a mountain of empty water bottles and Coke cans. In the front of the room, someone laughs as a fellow group member writes an equation on an already-crowded whiteboard. In the corner, a student bangs his hands on his laptop and consults his team with frustration. The focus, laughter and frustration all are directed at one event: Emory Hackathon 2014, a 32 hour competition to build an app, or hack, with a team and showcase the creation to win a multitude of prizes. This year’s hackathon was hosted throughout the Math and Science building from April 12 at 10 a.m. until April 13 at 5 p.m. The event was co-hosted by Microsoft, who offered over $5000 in prizes for skilled coders and beginners and boasted more than 200 in total attendance. But what is a hackathon? And what is it that’s being hacked? At events like Emory Hackathon, there’s no actual “hacking” in the mainstream sense of the word. The goal is never to hack into another account or get through the firewall of a government database. Rather, a hackathon is an event where computer programmers come together to work intensively on software products and programs. It’s a combination of the words “hack” and “marathon,” hence the need for computer prowess and coding stamina. College hackathons started gaining popularity in the spring of 2009, when a hackathon at the University of Pennsylvania, PennApps, was born. Since then, hackathons have grown in quantity and attendance on campuses around the nation. Many hackathons offer big prizes for the most innovative creations. PennApps has since grown to host over 2500 hackers and offer upwards of $30,000 in rewards. Emory Hackathon, only in its second year, cannot yet boast those types of numbers. But it is growing, and quickly. 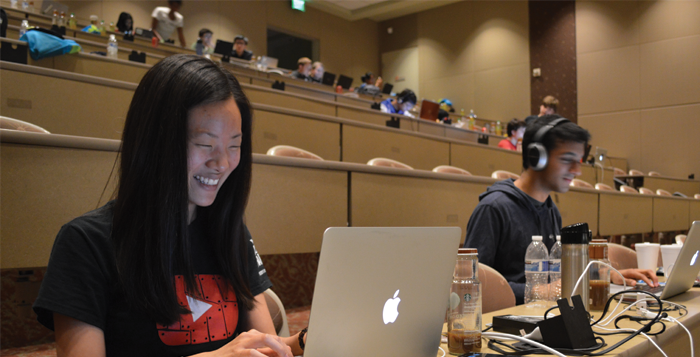 Last year, Emory Hackathon was a small event with around 50 participants. This year, over 200 students participated. While some participants were Emory students, many came from neighboring schools like Georgia Institute of Technology (Georgia Tech) or Georgia State University. Hackers came from five different states, and their education backgrounds ranged from high school to medical school. “Hackathons are the biggest thing to happen to CS (computer science) in a long time,” College senior and lead organizer for the event Tom Mou said. Mou, along with many others from the Emory Robotics and Computer Engineering Club, dedicated many months to planning this year’s event. The team spent much of their time obtaining sponsors, planning logistics and even hosted coding workshops for beginners in preparation for the competition. Mou stressed the importance of gaining sponsors for events like this on campus. Microsoft co-sponsored the event, in addition to other companies like Google, United Way, Uber, Zipcar, Wolfram, MailChimp, Mandril, Twilio and many others. The hackathon was also sponsored in part by Emory’s Department of Mathematics and Computer Science, Department of Chemistry, Laney Graduate School, College Council and Robotics and Engineering Club. Sponsors helped provide food, prizes and speakers at the event. The prizes ranged from a Microsoft Surface 2 tablet for each team member, $500 in cash and one year WolframAlpha Pro/Mathematica passes for the Grand Prize winner to Startup Chowdown tickets at Atlanta Tech Village for the best startup-friendly hack. The best novice team received a $250 team cash prize and 6 month Code School passes. With prizes for novice teams and support available from experienced hackers, the event was open to all skill levels. The Atlanta community came out bright and early. Check-in started at 8:30 a.m., followed by a kickoff ceremony, tech talks and then lunch, which served as a meet and greet for the participants. Then, things got quiet and the hacking commenced. Food kept many hackers going throughout the event. Participants ploughed through five meals, 12 pounds of ground coffee, 150 bottles of Starbucks iced coffee and, of course, pieces upon pieces of pizza. “It’s not a hackathon without midnight pizza,” Mou laughed. Just before the midnight pizza, work began getting more intense all over the Math and Science building. Each team, consisting of a maximum of four members, only had 32 hours to complete their hacks. While some Emory students decided to go back to their rooms for the night, many of the hackers worked into the early hours of the morning, taking turns napping in various designated sections in the building. While teams were scattered across different rooms, the hub seemed to be room 208, the giant lecture hall. The room was quiet, but there seemed to be a charge to the air, like a sort of silent frenzy. Wang was on a team with her brother, Christopher Wang, and her brother’s friend, Kush Patel, both sophomores at Georgia Tech. Christal and Patel, both novices, teamed up with Christopher, an experienced programmer, for the weekend. The trio’s app, named PhotoSinc, was a picture service that took photos from a phone, uploaded and tagged them on the cloud, and then sent them individually to the tagged person. Essentially, the app allows people to share photos but bypasses social media. Another team, consisting of Trevor Goodyear, Gene Chorba, William Wood and Gabriel Siewe, all CS majors from Georgia State University, created an app called Shelter, which provides a portal for homeless shelters to maintain databases of the homeless with pictures and information related to each individual. Though they are both experienced coders, it was Goodyear and Siewe’s first hackathon. “We tried to ask to be in the novice category,” Goodyear joked. “They said no,” Chorba said with a grin. It ended up only being fair; Shelter won three prizes at the event, including Second Place overall, the United Way Hack for the Homeless Prize for the best hack that addressed an issue regarding homelessness and Best Use of Twilio application programming interface (API). The grand prize went to College senior Neil Sethi and his team members Angie Palm, Brendan Isham and Shivani Negi, all students at Georgia Tech. Their hack, called Musiqu.es, was a sound sampling web application that allows users to act as a DJ on the go. Third place went to Parachute, an app that delivers ice cream directly to the consumer by quadricopter. The creators, all Georgia Tech students, are now talking to King of Pops about the opportunity to deliver popsicles to customers by dropping them in tiny parachutes. The high school team from Milton, Georgia took home the top new hacker prize. All hacks were due at 3 p.m., when each team was given three minutes to demo their app to the judges. Then, judges deliberated and awarded prizes at the closing ceremony. Closing ceremony speakers included Protip Biswas, vice president of homelessness at United Way of Atlanta, Devin Rader, developer evangelist at Twilio and Brian Easter, CEO of Nebo Agency. But learning wasn’t the only thing happening at the event; participants also made sure to make time to have some fun. However, despite all of Hackathon’s success, Mou believes there is still room for improvement. He hopes that each year’s success will build upon the next. The only place to go, it seems, is up.